How strong is Stonecutter’s Temple? This is a question to the pro-gamers out there. How strong is the new tower Stonecutter’s Temple in your opinion. Do you make use of it? It has the same damage bonus effect as Shadow, so I tried to keep things low. How is your experience with it? OP or do we need a buff to keep up with darkness? Looking forward to your opinions on this topic! This entry was posted in Game Mechanics on January 28, 2016 by Andy. Once I tried metropolis strat. Iiron and Satellite main with other 13 metro support towers for Stonecutter’s Temple. The Satellite was for killing bosses The Iron, Knus and a jilly kills all small and normal creeps before Satellite hits. I’m in the same boat as everyone else. It’s a good tower, just not up to the same level as Darkness ones are yet. Damage is obviously excellent, but slow rate-of-fire and one range make it very challenging to level up through conventional means (I’ve only got it to Level 99 in ONE game) which unfortunately has a large detriment to its secondary effect. The only other issue I have with it is that Metro as a deck tends to be fairly weak, about on par with Nature, but with even less support options. As a result, it gets really hard to pump up the membership while remaining very competitive. I’m in the same boat as the other two. It’s pretty good, but still falls very short of the Darkness equivalent. I find this is because of two basic reasons. One, is that it’s low rate-of-fire and one range make it very difficult to hit Level 99, which it basically needs to do to be effective. And two, because its effect requires Metro, which isn’t as good at support as Nature, nor as lethal as Darkness, it’s very difficult to keep its effectiveness up. 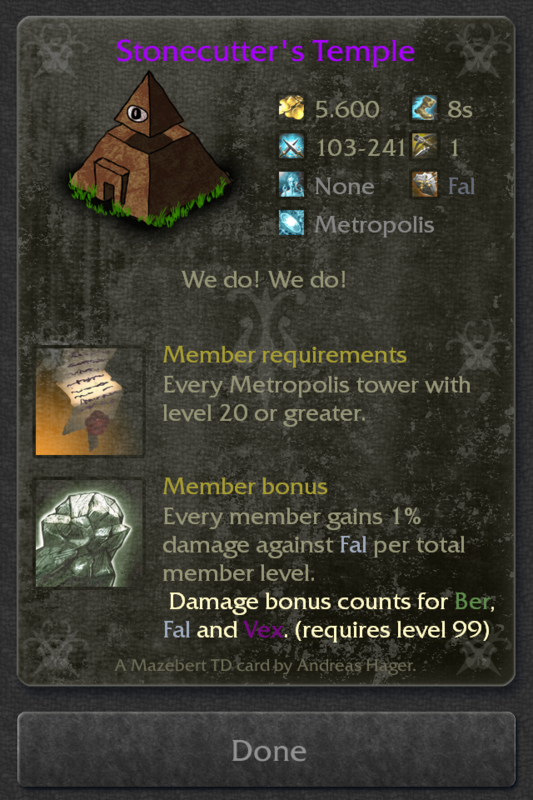 The only things I could suggest would be lowering the level where everything gets debuffed, or providing a second effect on the tower that boosts the towers output using the membership mechanic. its not good at all. And I have been trying to break game with metro for like the last year or so. 1. Stonecutter pretends late game damage comes from more than one tower, and we know this not to be true in the bonus round. you are lucky if a second tower is dishing 10% of your carries damage. doing the math with the damage only really effecting one tower – it is clear the cutter falls short of the 10k cap shadow has on it’s bonus damage. 3. Stone cutter needs other classes to level its towers. It seems only to make sense if metro is some juggernaut of a support class, which it is not in the current meta. Darkness is not at all reliant on other classes, only is possibly optimized with holgar. I was able to get 170k+ seconds in the bonus round using a metropolis carry + the stonecutter’s temple. I was only able to manage around 70k seconds with the shadow. This might be due to poor play with darkness, but I think it definitely places metro in a close range to darkness now. I would like to see something similar with nature now, so that all three elements are viable for bonus round play. Argon, which carry did you use for your score? I guess it wasn’t the satellite as it would burn down the gold too fast. Mr Iron maybe? Or the hitman? creeps killed in range have 2% chance to gain damage against ber , fal and vex? @Andy – I used Iron man into Blofeld Satellite near the end of the run. Blofeld satellite can last a relatively long time if you use Miss Jilly’s to eliminate most of the creeps. Further, even at relatively low golds, the satellite combined with the pyramid does far more damage than the Shadow with blood demon blade. The shadow with blood demon blade has around 600 base damage, multiplied by the 10000% gives it an effective 60000 base damage. With 40 million gold in the bank, the blofeld satellite + stonecutters temple easily has 90000 effective base damage. Gonna give this strategy a try soon, but I doubt I’ll gonna make it only slightly as far as you did. It’s quite amazing what you guys are doing with this game. If I run metro/nature, that’s when i use satalite/temple. I will start off with dandelion carry with some scientists until I gather 4 wolves to go wolfpack build before round 50. Then after that I work on throwing down 3 money bins, a ganesha and a manitou close to my alpha wolf. I fill the entire board with wolves other than those and toss wolf pelts on every tower that isnt a wolf. I’ll load keys on everything. Then I’ll work this to round 300 out of a 500 round game before any major changes. My item choice doesn’t change on my carry after I get them all, same ones every game. Plasma blade, GT1, mummy bandages, spectral daggers, Excalibur, Blade of darkness. (At round 300, my attack speed is already high enough to exchange mummy wraps for reaver, it’s crucial for bonus round and for fast forwarding waves). Until round 300, I will be saving 3 more money bins, just for money security, and black widow for more money. Now that we are on 300 I pause and exchange my alpha wolf with satelite, I drop the temple on ganesha (since a lot of you guys are missing how ganesha levels it’s off other towers leveling. Usually level 99 in 50ish rounds or less.) 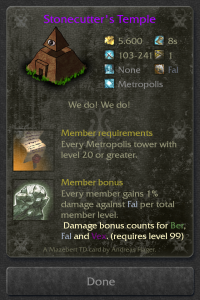 Now replace as many wolves with metro towers, it doesn’t really matter what you use here, the wolves have already bumped the hell out of the levels on the tower placement and the keys will continue spreading exp. Leave manitou your going to need him. It won’t hurt to have the highest multicrit as possible. Don’t forget to trans all your wolf pelt, and leave keys. But keep reaper on. It saves gold since one one strike you can take out a huge mass wave. Correction, helm of hades, not blade of darkness. I’d also like to add, I played this game years ago and didn’t play it for a long time, so after picking it back up and seeing how I am required to aquire new cards via quests, I’m missing a bunch of ‘must have’ cards since it appears to be limited to one quest a day. I haven’t cleared the last level yet because of lack of golden potion cards. But with the strategy I posted I’m able to get to 7900 seconds, and that’s not with insane damage like the first guy posted. My Max on satalite was like 15bil. Still with the placements, and the use of reaver the overflow and leaks are taken care of quite well, and it manages the money better. The game mechanics are very broad, there are other methods to win besides sole damage, DPS is far more important. 4. Use Keys of Wisdom to lvl up all the lowest towers. Usually by end of game every tower is above 20. Stonecutter has a total level over >700 and rises continually through the bonus round. Blofeld was often hitting 1.4B damage and Stonecutter was not far behind, hitting at about 1s latency. One time i did this, scored over 7600 seconds on the bonus round this way. I find Stonecutter levelling offsets the money drain. Sorry, i guess that doesn’t make sense. Iron man wasn’t really second carry, as Stonecutter was second strongest tower. Iron man eats all the Fist of Iron/Herb Witches Cauldron/Irish Pub Barrels. Well yesterday I had a Nature + Metro build. For unique towers I built Manitou and Ganesha and then replaced lvl 99 Ganesha with Temple. For about 350 waves my main carry was Bear Hunter, Scarface whom i farmed like crazy and I built Mr. Iron pretty early so as to feed him objects. After about 350 I replaced most towers with money bins and starting 3 spots with Irish Pubs and replaced Bear Hunter with Satellite equipped with all luxury items and boy it took me to 2700 sec on Bonus round after 500 game. Temple helped a lot in damage booster so in my opinion Temple is really a good card but depends heavily on metro build. Best for Satellite + Money Bin combo.